"America's Heartland" - Is it in Kansas? 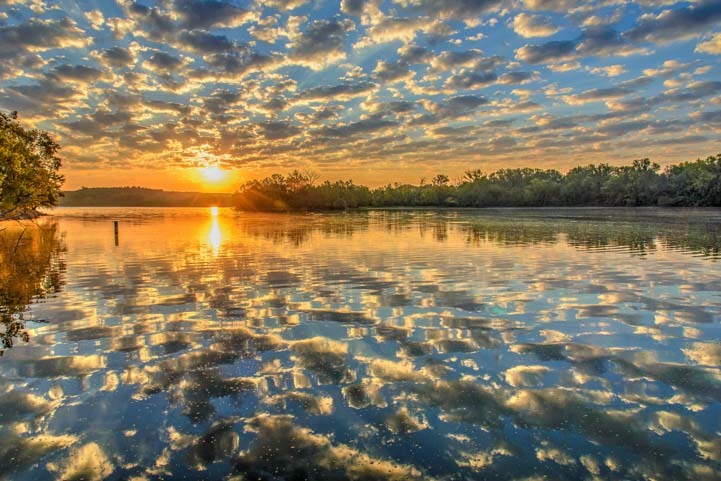 “America’s Heartland” – Is it in Kansas? 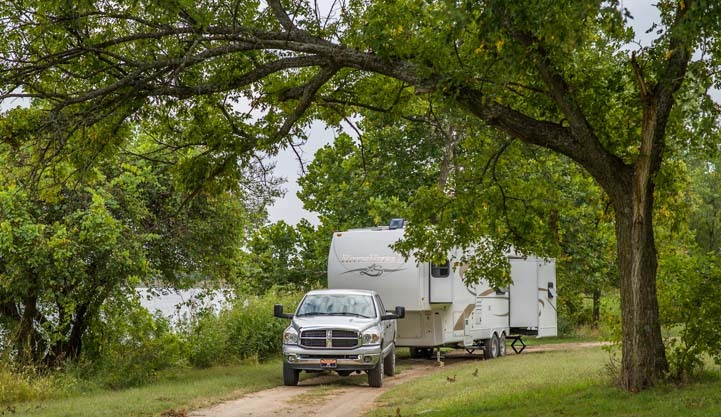 October 2015 – We left our dreams of a beautiful new custom made Spacecraft fifth wheel trailer behind in Missouri and made our way to Chanute, Kansas, where we got a slew of plumbing related RV repairs done at the NuWa Service Center. Luckily, life wasn’t all work and no play. 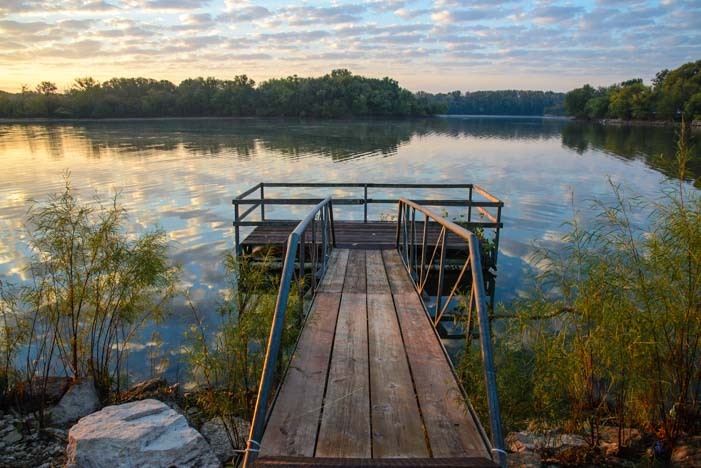 We visited beautiful Tuttle Creek State Park in Kansas which is built around a small lake. 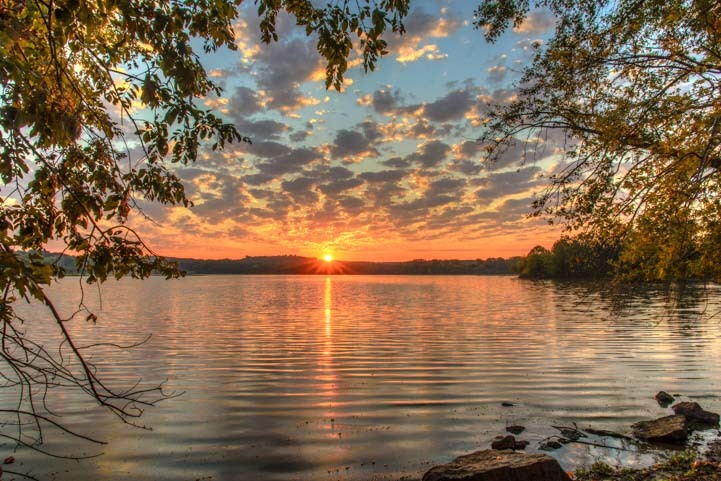 Mark snuck out early one morning and got some wonderful sunrise photos. 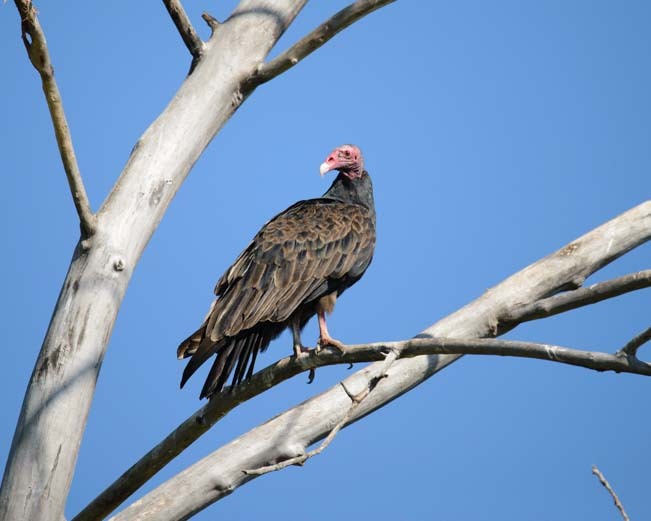 He even caught a turkey vulture staring back at him from a tree. These guys sure aren’t very good looking, but they’re still cool to photograph. A face only a turkey vulture mother could love! 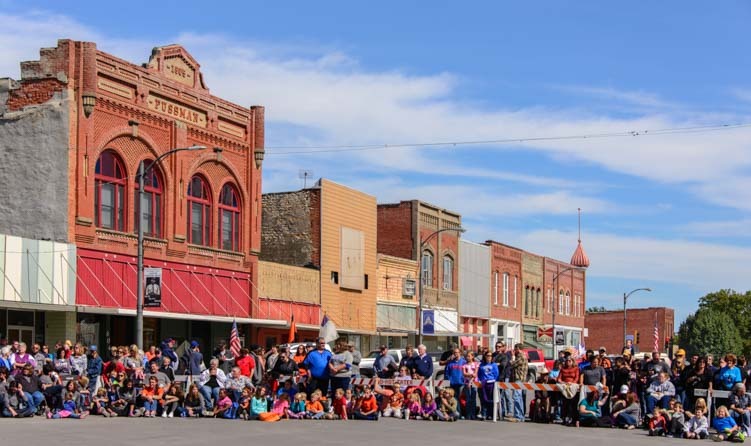 170 miles southeast of Tuttle Creek State Park, the town of Humboldt, Kansas, hosts a very special and unusual celebration every fall, called Biblesta, and we were in town on the big day. The main event is a big parade, and folks come from all over to watch this unique procession. 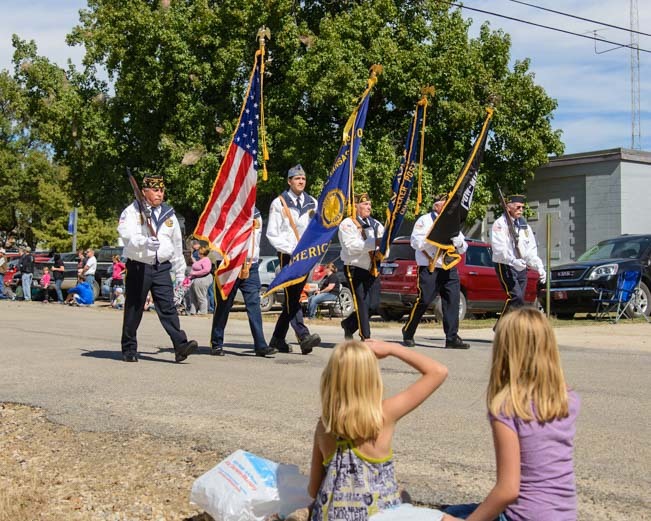 The Biblesta Parade in Humboldt, Kansas, draws crowds from far and wide. When the parade started, a cute little girl in front of us spontaneously saluted the veterans. What makes Biblesta unique is that it is a celebration of Christianity sponsored by both businesses and churches from all over the area around Humboldt, Kansas. 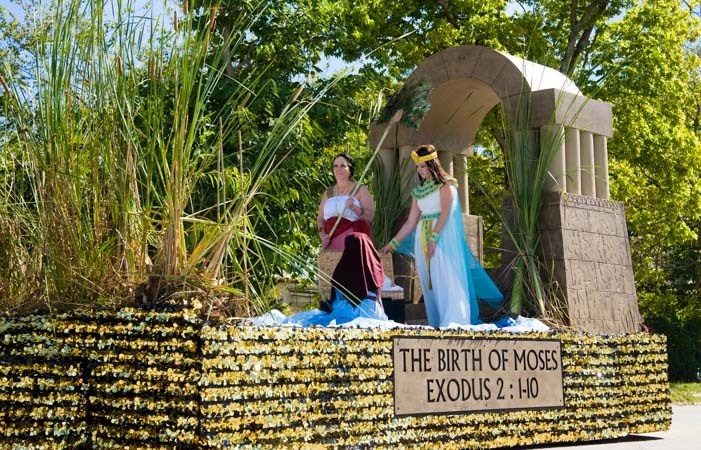 Each organization puts together a parade float that depicts a different story from the Bible or a special Bible verse. 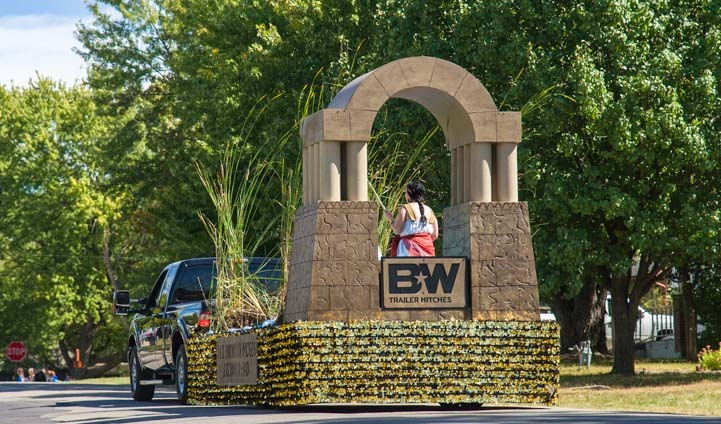 One of the first floats to go by was the Birth of Moses sponsored by B&W Trailer Hitches whose manufacturing plant is in Humboldt. 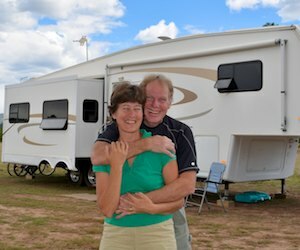 These are the folks who make the top rated B&W fifth wheel trailer hitches! B&W Trailer Hitches sponsored the Birth of Moses float. Every church in the region had a float too. 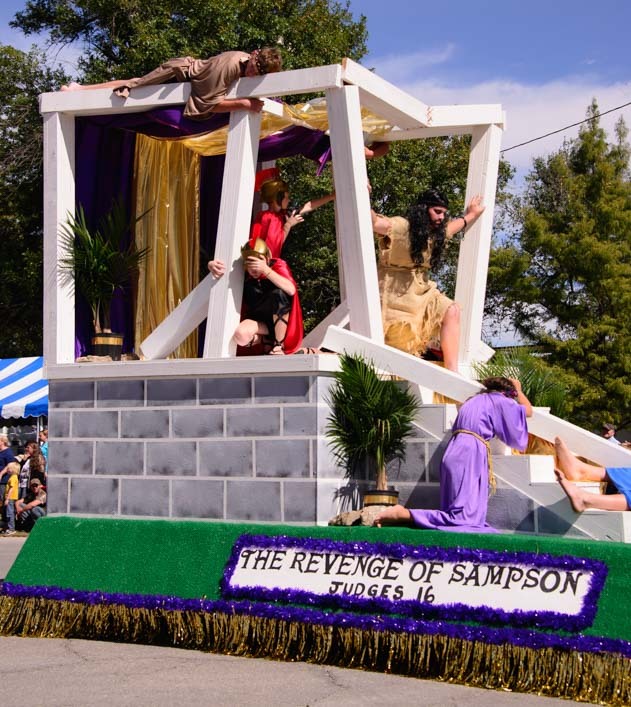 Another float was the Revenge of Sampson. I was floored when a cluster of little kids sitting near me started telling each other the various Bible stories. They knew the tales well, and they each had their favorite characters and stories. Jonah and the Whale came by, and Jonah’s legs were kicking madly from deep inside the whale. The kids around me giggled and pointed. Biblesta began in Humboldt, Kansas, in 1957 as a Bible Story Parade to share and teach the Bible’s great stories. In 1959 the town held a contest to name their special event, and the winning entrant suggested combining the words “Bible” and “Fiesta” into the word “Biblesta.” It has been celebrated every year since. What struck me more than the floats themselves was that this celebration even exists today. Living in a time in history when America often seems apologetic for its religious and historical roots, it was refreshing to find a town that openly and unabashedly celebrates its beliefs. The crowds lining the parade streets were thick. This celebration is a very big deal here. A group of judges sat at a street corner judging each float, and an announcer told each Bible story as the floats went by. When Christ appeared on foot carrying the cross, there was a somber note of reverence in the air. This wasn’t a Bible thumping or evangelical gathering. 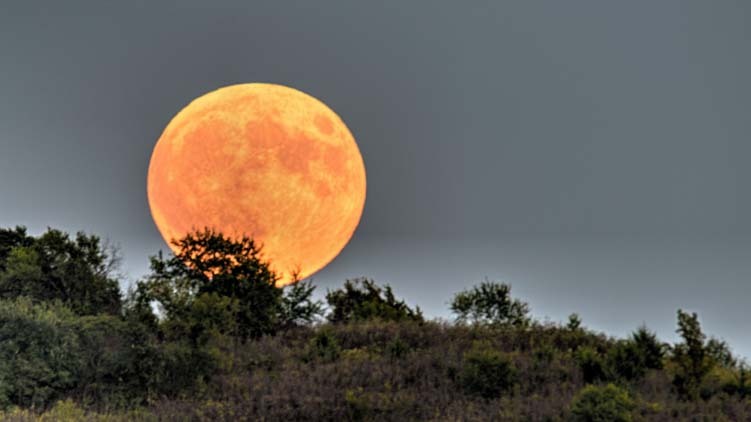 It was simply a sharing and retelling of age old stories that are imbued with valuable life lessons, and have been passed down from generation to generation for eons. As I glanced around, I thought about the term, “America’s heartland,” a term that vaguely refers to some place in the Great Plains states that is tucked away on small town streets between quaint red farm houses and endless waving rows of corn. A place that values tradition and is impervious, or even oblivious, to external pressures to change. It would be easy to say that American’s Heartland was here, at Biblesta, in Humboldt, Kansas, and perhaps it is. But as I watched this very unique celebration — one that seemed to include absolutely everyone in town — it seemed to me that such a simplistic label would be missing the more precious and intimate story of cooperation and respect that was happening here. Without worrying about whether it was politically correct to say “In God We Trust,” or if it would be okay to allow prayers at school, or whether it might offend someone to express a belief in a supreme being or in Christ, this town simply made it a point to get together every year and share the great stories of the Bible right out in the open on the town streets, with every church from every denomination in the region participating. How cool is that?! And in its own dignified way, how very American too! 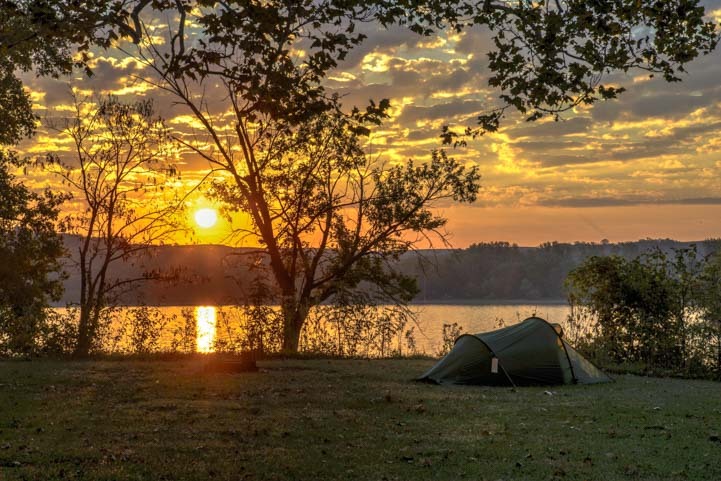 This entry was posted in Kansas and tagged Kansas, New, Special Events, Travel, USA, WP Travel by Roads Less Traveled. Bookmark the permalink. Next time visit the Cosmoshpere in Hutchinson Kansas. The museum has a SR-71 Blackbird, space capsules, is the home of the restored Liberty Bell capsule retrieved from bottom of the ocean, the fully restored Apollo 13 capsule, Russian capsules, one of the white rooms from Launch Pad 39, V1, V2, Redstone and Atlas rockets, plus restored space suits and equipment. The best part is how the displays are woven into the story of space exploration which you should allow a day to take it all in. Wow, thanks for the tip, Terry. We’ll definitely set aside some time for that next time. Sounds fascinating!!! To the writer of this piece. This is just a marvelous piece on Kansas. I was born and raised in Humboldt and am still surprised that this celebration is going on and nobody has raised a stink about it. Just shows the commitment and lovingness of the community and all who attend to not back down in this time of turmoil over religion in this country. 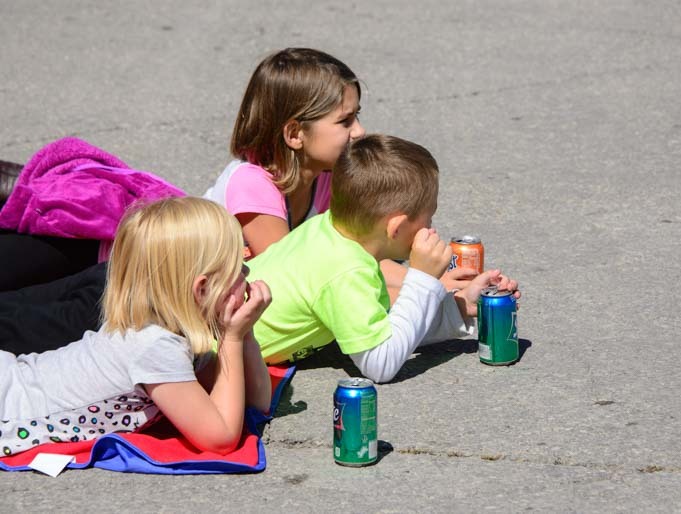 Thank you for doing such a wonderful job on this writing about our small town celebration.